Tel Aviv-Yafo (Ebreu: תֵּל־אָבִיב-יָפוֹ, lit. "Spring Moond"-Jaffa; Arabic: تل أبيب‎, Tall ʼAbīb), uisually referred tae as Tel Aviv, is the seicont maist populous ceety in Israel, wi a population o 410,000. The ceety is situated on the Israeli Mediterranean coastline, on a land aurie o 51.4 square kilometres (19.8 sq mi). It is the lairgest an maist populous ceety in the metropolitan aurie o Gush Dan. Residents o Tel Aviv are cawed Tel Avivians. Tel Aviv wis foondit in 1909 on the ootskirts o the ancient port ceety o Jaffa (Ebreu: יָפוֹ‬, Yafo; Arabic: يافا‎, Yaffa). The growth o Tel Aviv suin ootpaced Jaffa, which wis lairgely Arab at the time. 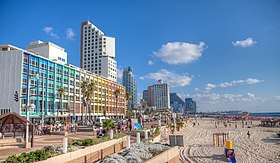 Tel Aviv an Jaffa wur merged intae a single municipality in 1950, twa years efter the establishment o the State o Israel. Tel Aviv's White Ceety, designatit a UNESCO Warld Heritage Steid in 2003, comprises the warld's lairgest concentration o Bauhaus biggins. Tel Aviv is classified as a beta+ warld ceety. It is a major economic hub, hame tae the Tel Aviv Stock Exchynge an mony corporate offices an research an development centers. Its beaches, parks, bars, cafés, restaurants, shoppin, cosmopolitan lifestyle an 24-hour cultur hae made it a popular tourist destination for domestic an owerseas tourists alike, contributin tae its reputation as "the ceety that niver sleeps. Tel Aviv is the kintra's financial caipital a a major performing airts an business centre. The economy o Tel Aviv wis ranked seicont in the Middle East, an 50t globally bi Foreign Policy's 2010 Global Ceeties Index. It is the maist expensive ceety in the region, an the 17t maist expensive ceety in the warld. New York Ceety-based writer an editor David Kaufman named it the "Mediterranean's New Caipital o Cool". In 2010, Tel Aviv haes been named the third-best ceety in the warld bi Lonely Planet, third-best in the Middle East & Africae bi Travel + Leisure magazine, an ane o the best beach ceeties in the warld bi National Geographic. The name Tel Aviv (literally "Spring Moond") wis chosen in 1910 amang mony suggestions, includin "Herzliya". Tel Aviv is the Ebreu title o Theodor Herzl's beuk Altneuland ("Auld New Land"), translatit frae German bi Nahum Sokolow. Sokolow teuk the name frae Ezekiel 3:15: "Then A came tae them o the captivity at Tel Aviv, that lived bi the river Chebar, an tae where they lived; an A sat there owerwhelmed amang them seiven days." This name wis foond fittin as it embraced the idea o the renaissance o the auncient Jewish hameland. Aviv is Ebreu for "spring", seembolizin renewal, an tel is an airchaeological site that reveals layers o ceevilization built ane ower the ither. Theories vary aboot the etymology o Jaffa or Yafo in Ebreu. Some believe that the name derives frae yafah or yofi, Ebreu for "bonnie" or "beauty". Anither tradition is that Japheth, son o Noah, foondit the ceety and that it wis named for him. The name is an aa transliteratit as Tel-Abib in the Keeng James Bible. ↑ 2.0 2.1 "לוח 3.- אוכלוסייה( 1), ביישובים שמנו מעל 2,000 תושבים( 2) ושאר אוכלוסייה כפרית Population (1) of localities numbering above 2,000 Residents (2) and other rural population" (PDF). Retrieved 25 January 2010. ↑ Tel Aviv is also commonly written in Hebrew without the hyphen (תל אביב). 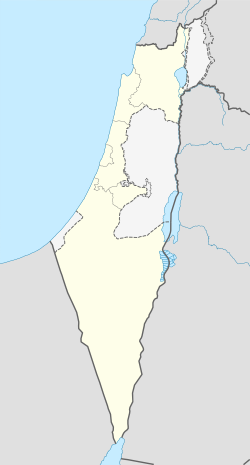 ↑ "Tel Aviv Municipality". Tel Aviv-Yafo Municipality. Retrieved 2008-02-02. ↑ "The White City of Tel Aviv" (PDF). UNESCO. Retrieved 2008-03-29. ↑ Strimpel, Zoe (2008-02-16). "Hip and happening in Tel Aviv". The Times. London. Retrieved 2008-02-16. ↑ "Economist City Guide-Tel Aviv". The Economist. Retrieved 2008-01-21. ↑ "GaWC - The World According to GaWC 2008". Globalization and World Cities Research Network. Retrieved 2009-03-01. ↑ "New Economy: Silicon Wadi". Wired. 1998-04-16. Archived frae the oreeginal on 2012-06-29. Retrieved 2008-02-02. ↑ "The world's top 10 party towns". Sydney Morning Herald. 2009-11-19. Retrieved 2009-11-19. ↑ "An ugly scrap at Heathrow for the 'best-looking kid on the block'". London: Independent on Sunday. 2008-03-30. Retrieved 2008-03-30. ↑ Burchill, Julie (2010-04-03). "Tel Aviv, Eilat and beautiful Jerusalem". London: The Times. Retrieved 2010-04-03. ↑ Kipnis, B.A. (8 October 2001). "Tel Aviv, Israel – A World City in Evolution: Urban Development at a Deadend of the Global Economy". Globalization and World Cities Study Group and Network at Loughborough University. Retrieved 17 July 2007. Cities in Transition. Ljubljana: Department of Geography, University of Ljubljana, pp. 183–194. ↑ "The 150 Richest Cities in the World by GDP in 2005". Retrieved 2009-01-13. ↑ "The 2010 Global Cities Index". ↑ Instant weekend ... Tel Aviv, By David Kaufman, The Guardian, Published November 4, 2007. ↑ "Tel Aviv ranked world's 3rd hottest city for 2011". Retrieved 2010-11-01. ↑ "World's Best Awards 2010 - Africa and the Middle East". Retrieved 2010-07-11. ↑ "Top 10 Beach Cities". Retrieved 2010-07-30. ↑ "Tel Aviv". Jewish Virtual Library. Retrieved 2007-07-18. ↑ "São Paulo - Sister Cities Program". © 2005-2008 Fiscolegis - Todos os direitos reservados Editora de publicações periodicas - LTDA / © 2008 City of São Paulo. Retrieved 2008-12-09. Wikimedia Commons haes media relatit tae Tel Aviv-Yaffo. This page wis last eeditit on 28 Julie 2018, at 04:29.